Crestware CW12 Crest Wood Bowl 12"
TigerChef > Dinnerware > Wooden Dinnerware >< Wooden Salad Bowls > Crestware CW12 Crest Wood Bowl 12"
✔ 4-ply thickness✔ Professional grade✔ Dimensions: 12"
$2.59 Royal ROY WWB 12 Woven Wood Salad Bowl 12"
$8.69 Crestware CW20 Crest Wood Bowl 20"
The Crestware CW12 Crest Wood Bowl 12" is an excellent addition to restaurants and catering companies. 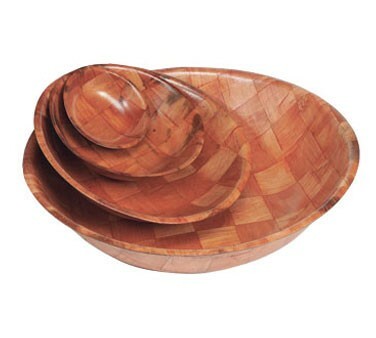 This bowl features a unique, woven wood construction which adds a natural touch to a variety of table settings. Boasting a coated surface, this bowl is non-absorbent and is a great option for serving salads, fruits and other delicious food. This professional grade wood bowl is exceptionally strong to keep up with the high demands of commercial use. Stylish and functional, this bowl is perfect for food service facilities.